Noisebud filter consists of 4 filters (or 16, depends on how you look upon it), they are switchable between Lo pass, hi pass, band pass and band reject filter. The signals from the four filters are wired in a parallel chain. Every filter can be controlled by three different LFO’s where one is tempo synced; one normal and one extremely slow (a sLoFO). The LFO sections also have something we call VariFO. It adds another movement to the LFO and makes it less predictable. 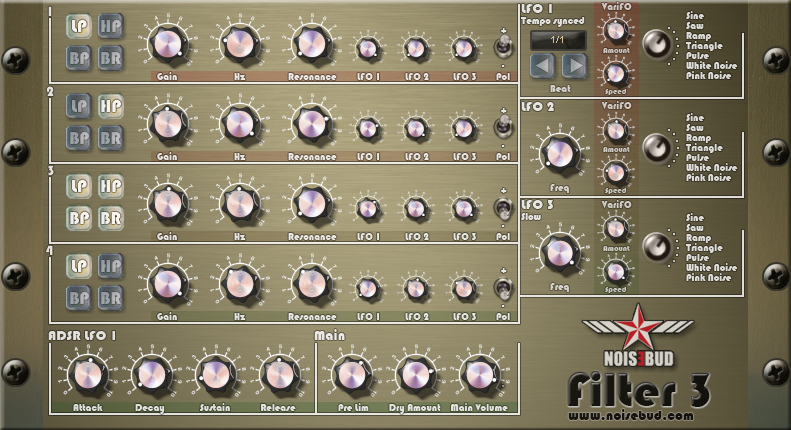 Every filter has an invert button so that you can silence frequencies that collide during heavy LFO movements. – You can now set the type of filter you like, you can have 4 LoPass filters if you like. You can even let one filter be both LoPass and a BandPass at the same time! – The first LFO is now tempo synced to the host!